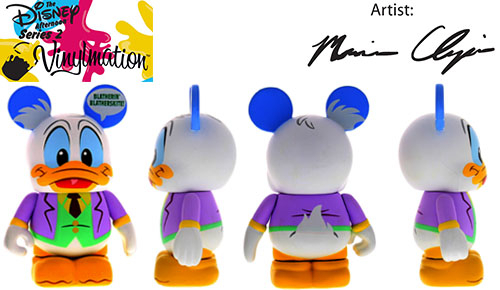 Wow this has been a great week for Vinylmation and a great year for Ducktales. A little while back Campcom said it would be releasing a HD version of the classic game “Ducktales”, and now Disney Afternoons is back and the first set of series 2 is Ducktales! I think I asked for it a long time ago, but today Disney announced that the set will include two figures- GizmoDuck and his mild manner self, Fenton Crackshell. Look at that shark fin on his head, how cool is that? Another great announcement from Disney, and one I know a lot of people are excited about. 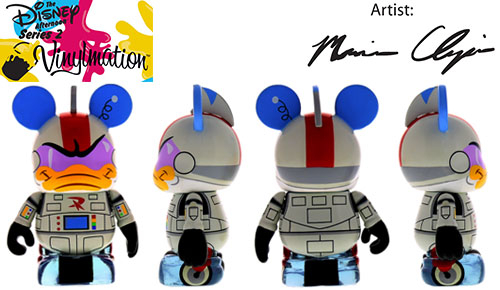 For some people the original Disney Afternoons sets were the last time they got excited for a new Vinylmation set. According to Disney the price has raised to $19.99 and there LE was raised to 1500 (But that seems about right number of figures at the moment.) This set will come out at D-Streets and online on July 19th. And look, Maria Clapsis is the artist, which is also cool! What do you think about this? Will this get you to stand in line? The original 2-packs were 26.99 a piece …. so they are lowering the price to 19.99? The price is $29.99, so a bit of an increase. No interest as long as Disney keeps rolling out that sad excuse for a Mickey mold..all you have to do is look at the original Disney Afternoon sets and see how much better they look compared to these pics. I like the Disney Afternoon idea and the fact they are coming out with these, but I agree with you Underdog about the old mold. If we’re getting new 2-packs for each series, I’d love to see Gadget and Monty from Rescue Ranger, Louie and Wildcat for Tailspin, Megavolt and Quackerjack from Darkwing Duck, and Pete and PJ from Goof Troop.